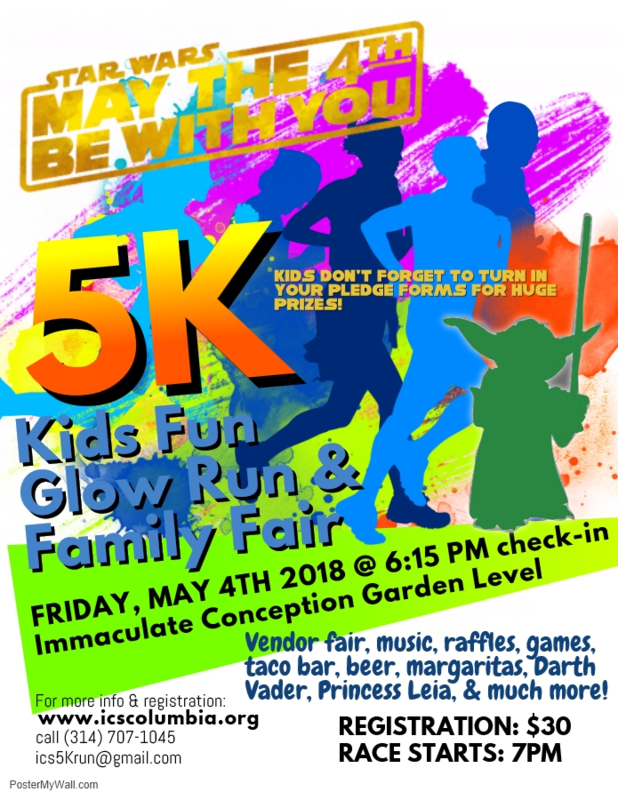 5th Annual ICS May the 4th Be With You 5K/Kids Fun Glow Run & Family Fair! We are excited once again to announce the 5th Annual ICS 5K/Kids Fun Run & Family Fair! For a new twist on our theme, we have decided to move our event to incorporate a Glow Run!!!! Our event will take place on Friday, May 4, 2018 at the Garden Level of Immaculate Conception Church. So we hope you bring your favorite lightsaber and join us at the ICS May the 4th Be With You 5K/Kids Fun Glow Run & Family Fair! Check-in will be at 6:15 pm, and the races will begin at 7 pm. Immediately following the runs, we will be holding a Family Fun Fair from 7 pm - 10 pm with music from the ICS Jazz Band and Mr. Hake’s Main Street Jazz Band, raffles, games, taco bar, beer, margaritas, bounce house, face painting, prizes, and vendor fair (to shop for Mother's & Father's Day) all to raise funds to support the Catholic Education & Activity Center. There will be some special guest appearances from Darth Vader and Princess Leia to cheer us on!!! We also are giving away 1st, 2nd, and 3rd Place Prizes for the child who brings in the most race pledges! This is sure to be a great fun filled day for all.